CBR Ring Slave Rainbow Anodized Tongue Barbell Piercing. 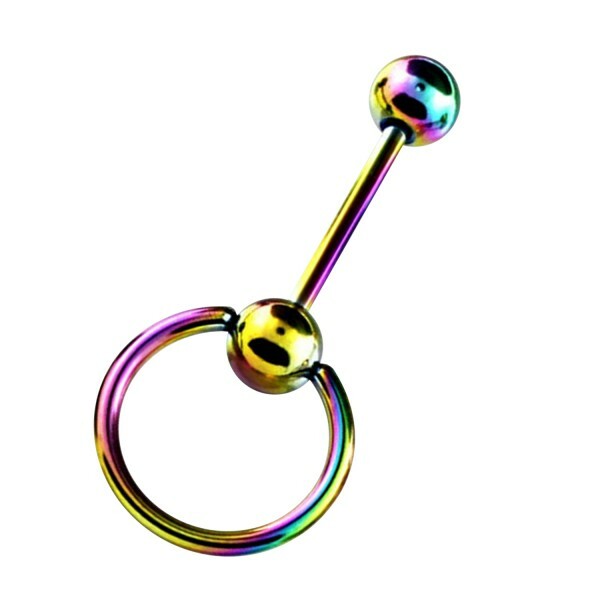 This body jewel cbr ring slave rainbow anodized tongue barbell piercing made in 316L Surgical Steel, of Circular shape, with Rainbow as the predominant colour is proposed to you in 1.6mm/14G size, in 16mm (5/8") length and with 06mm balls. There are 3 other versions of this product: blue, black and gold. This product is often bough with silver shiny effect 316l surgical steel tongue bar ring piercing and purple pearl effect tongue bar ring with thin glitter.